As an Outlook user since 1995, I can tell with all honesty that I am quite happy with Outlook. I have used Lotus Notes for a few years prior to Outlook. 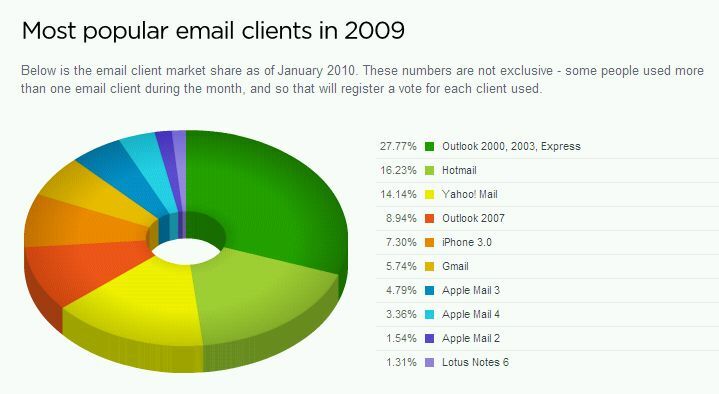 I am still using hotmail, yahoo mail and Gmail. I love the way Outlook integrates calendar and contacts easily into the email part of the software. I love the fact that synching my Outlook data to my BlackBerry is short of idiot-proof. I also love the idea of sharing my Outlook calendar with my family and synching Outlook calendar with Google calendar was something I thought was going to be a painful exercise. That said, Outlook has its limitations. 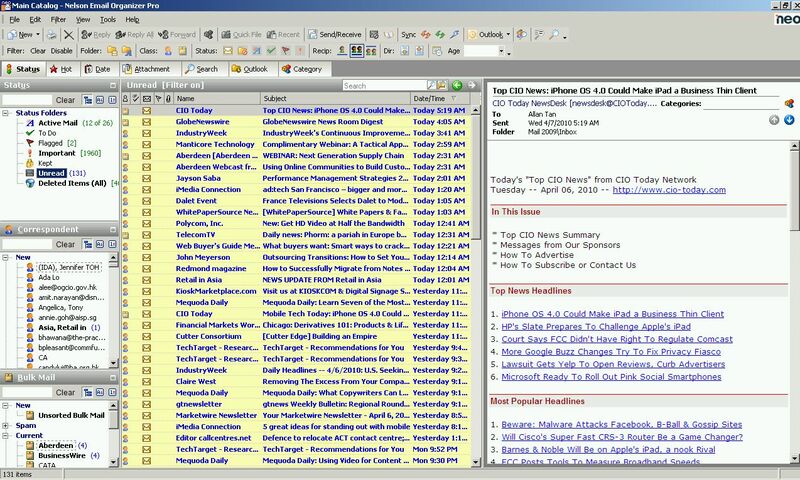 For one thing, while you can sort your incoming email by date or sender or subject header, finding a specific email from a specific person, or even leafing through unread emails is something Outlook programmers probably didn’t think of early on in the software’s design. Yes, I can create folders and have rules to automatically perform specific tasks like move or delete emails as and when they arrive. But it would be great if I can scan through only my unread messages. It would be absolutely great if I can find attachments and the emails that came with it. I can’t remember the number of times I was looking for the one email that had a JPEG attachment. It would also be nice to see email correspondences with specific people, both as sender and recipient. And I don’t know about you, I’d like to be able to prioritize my emails so that emails that are directed to me as a person – as opposed to those bulk emails or cc’d messages – can get my attention before all other emails thrown at me. One thing I love about my Outlook contacts is my ability to group contacts according to categories. I often wonder why Outlook designers didn’t see this feature as something worth importing into the email database itself. Some years back my Outlook client crashed on me – twice over a six month window. The first time, I lost about six months’ worth of email. The second time cost me a couple of months’ worth. In both cases, it was because my PST files got bigger than 2GB, thanks in part to PowerPoint attachments. These days I was told the 2GB barrier is already a non-issue. But as a result of my earlier experience, I have developed the habit of creating PST files and moving old emails to specific PST files, for example 2009.pst holds all emails send and received in 2009, just in case it happens. I don’t understand the archive function of Outlook so I avoid it like the plague. It also takes, what to me feels like forever, to look a specific email. So it’s another reason why I split my emails to specific years. 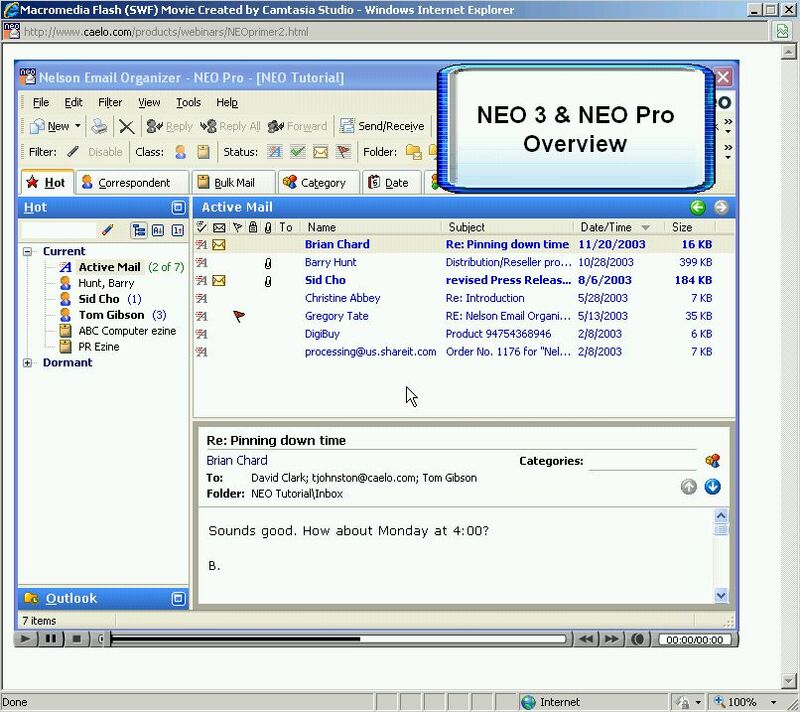 Then recently I was asked to review an Outlook add-on software called NEO Pro. Developed by a Dutch company called Caelo Software, the company markets itself as developing solutions for people who spend too much time managing their emails. The first time I installed Neo Pro 4, I was very worried. I didn’t bother to read the manual and I avoided the online tutorial thinking I could get by without help (it’s an ego thing). NEO (short for Nelson Email Organizer) is as advertised – an organizer. In fact, the NEO user interface intimidated me so much that I didn’t touch the software for the first month since I installed it. Until, I agreed to do a 30 minute demo, organized by phone. What eased my concern was being told that the NEO software doesn’t touch my Outlook whatsoever. That I can stop using NEO and any time and go back to using Outlook. I asked my tutor how long it would take to get used to the new interface. He suggested that I spend a whole week using just NEO to get accustomed to the interface. NEO promises to organize, prioritize and help me find my email. In all three categories, the product is superb. Caelo employs an advanced indexing technology to organize my emails by person (correspondent), by date, by attachment, and more interestingly by category, which is just about any name under which you want to remember your emails. NEO even comes with a Bulk Mail feature that you can customize so that specific emails can be sorted out automatically. How many emails do you get in a day? I get an average of maybe 300 emails a day. About 100 of these are from subscriptions. Another 150 are actual work emails. The rest are unsolicited junk mails. A common challenge for me is finding specific emails. This becomes a big problem when I don’t clear my emails after a few days. NEO’s search function works like magic – fast and accurate. It takes a little effort to learn the software. You will come to realize that it takes a lot more effort to refrain from going back to the original Outlook client. There is no written manual! At least I couldn’t find one. I like to read instructions on paper – where possible (call me a romantic). It’s hard not to like what NEO promises and does. I can tell that I am much more productive these days. I don’t spend too much time looking for specific emails. I find the default settings of buttons very daunting and intimidating. But I have come to realize that as with most software, it takes a little getting used to. I’ve had software products thrown at me that require you set aside time to read the manual if you want to use even the basics of the technology. Caelo took time to put together webinars on how to use specific features like creating categories. The tone of the instructor may be boring but if you pay enough attention, you will quickly learn the ropes around NEO Pro enough to help you reduce your email reading time by a good chunk. I understand that NEO Pro 4 costs US$50. For an add-on, some people might find this steep. But how much is the cost of productivity these days? Or the cost of getting a piece of your life back (and not having to spend it all checking your emails)? If you want to get a portion of your life back – away from e-mail, you might want to get NEO Pro. I think they sell it online. Hey I really like your article!! I find a lot of similarities to my work life and my never ending search for one special e-mail! !